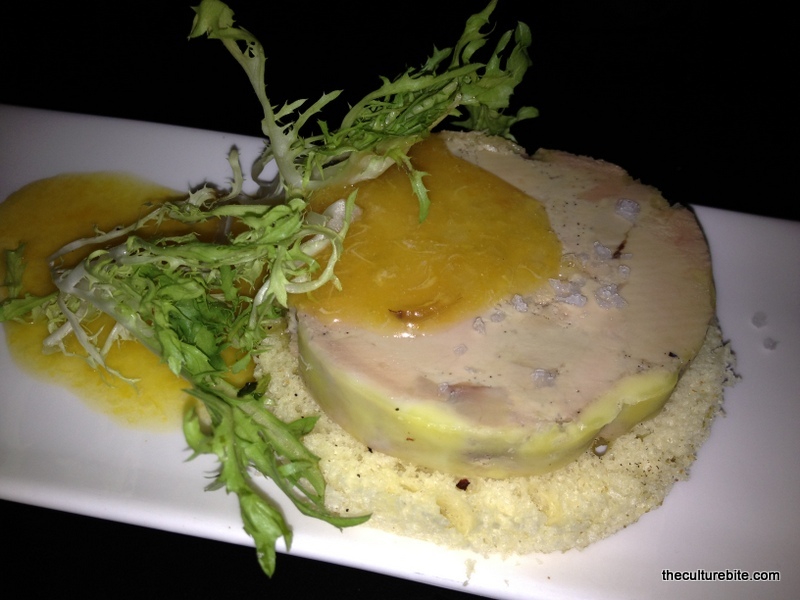 As you may have heard, California is saying goodbye to foie gras on June 30, 2012. To celebrate our last experience with the beloved foie gras, we dined at Bisou in the Castro a day before the ban went into effect for an un-foie-gras-table meal. Haha, see what I did there? We ordered the foie gras tasting menu complete with an appetizer, entree and dessert ($75/p). Five foie gras’ later, I’m happy to say my goodbyes to the little fatty goose livers. Foie Gras Pavé – Cool, buttery pavé de foie gras on toast and drizzled with an orange syrup. This was amazingly delicious. 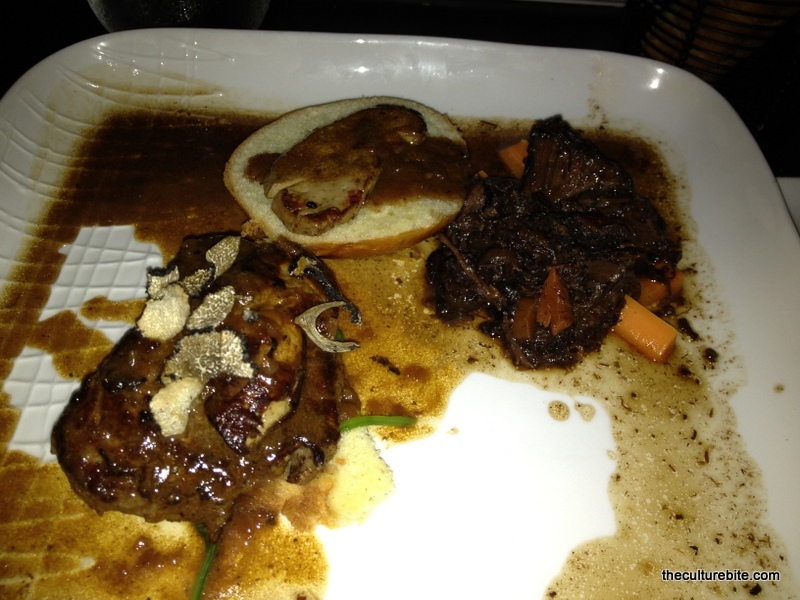 Beef Duo – Filet mignon topped with a piece of torched foie gras and shaved truffles and beef bourguignon with a piece of seared foie gras on top of a brioche bun. I almost quit halfway to save myself, but my greed got the best of me. I was a little relieved when I discovered the hidden pile of spinach hiding underneath the filet. 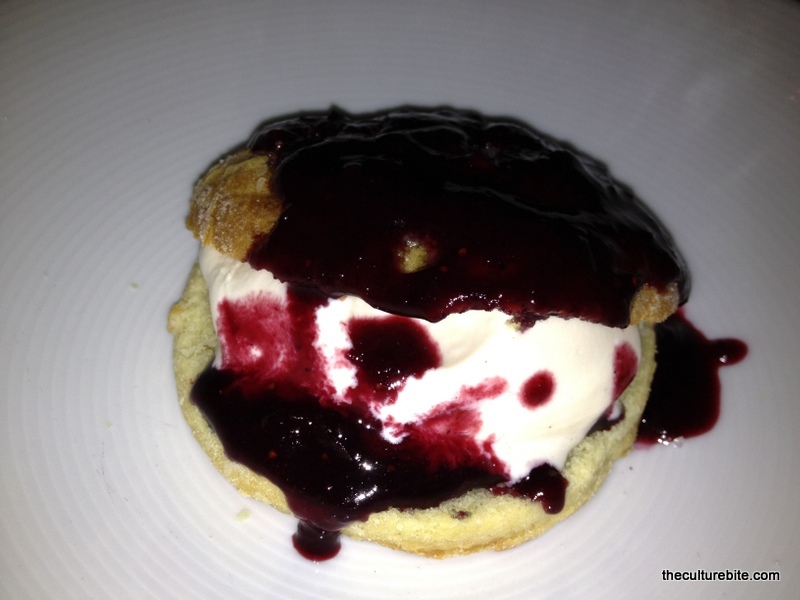 Shortcake w/Ice Cream – Foie Gras ice cream and two pieces of dense shortcake. At this point, I could not take any more. To top it off, I have no clue why anyone would think foie gras ice cream would taste delicious. The ice cream tasted like iron and there was no amount of raspberry sauce to overpower the taste. I was almost offended by this dish, but then K and I concluded that this was the perfect way to say goodbye to foie gras. Other than the dessert, I think Bisou did a great job of celebrating foie gras with their tasting menu. But after this meal, I’ve learned that foie gras is best eaten in small increments. Let me take a second to comment on the vibe of this restaurant. Bisou is much louder and trendier than its older but cuter sister restaurant ChouChou in Forrest Hill (which was sold to a new owner a few years ago). Decked out in purple padded walls and black booths, all the single people in the Castro are standing at the bar talking and laughing over the blaring club music. Though every time I come to Bisou, I feel very out of place. It could be because the owner seems to know, kiss and hug everyone in the restaurant but “grandma” me and “grandpa” K. But K and I keep coming back, leaving satisfied. « Disneyland vs. Walt Disney World – What’s the difference?